For great roast potatoes, place some blanched spuds under the meat rack, so they cook in the fat that is rendered from the beef above. Cooking time: 1 ½ hours, plus resting. Take the meat out of the fridge at least 2 hours before cooking. Preheat the oven to 200°C, gas mark 6. Smear the beef with the oil and season it very well all over. Place on a rack in a large roasting tin. 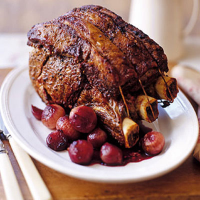 Cook the beef in the oven for 10–15 minutes, then turn the temperature down to 170°C, gas mark 3 and cook for 12–15 minutes per 500g for rare, 15–18 minutes per 500g for medium and 20 minutes per 500g for well done. It will need to rest on the rack for at least 15–20 minutes before it's carved. Meanwhile, braise the shallots. Put the oil and butter in a frying pan with the shallots and thyme. Season with salt and cook over a medium heat for 5 minutes or until golden. Sprinkle on the sugar and cook for another 10 minutes, moving the shallots around so they colour evenly. Pour in the wine and turn the heat up to reduce this by two thirds. Add the stock and reduce by two thirds again. For the sauce, remove the shallots with a slotted spoon and put into a saucepan with the wine, port and thyme. Simmer for 15–20 minutes to reduce by two thirds. Add the stock and the liquid from the shallots and cook for 20–25 minutes to reduce by half. Sieve, return to the pan and whisk in the butter. Slice the beef; serve with the shallots and sauce.